It’s hard to believe that this time last week I was in Nepal. 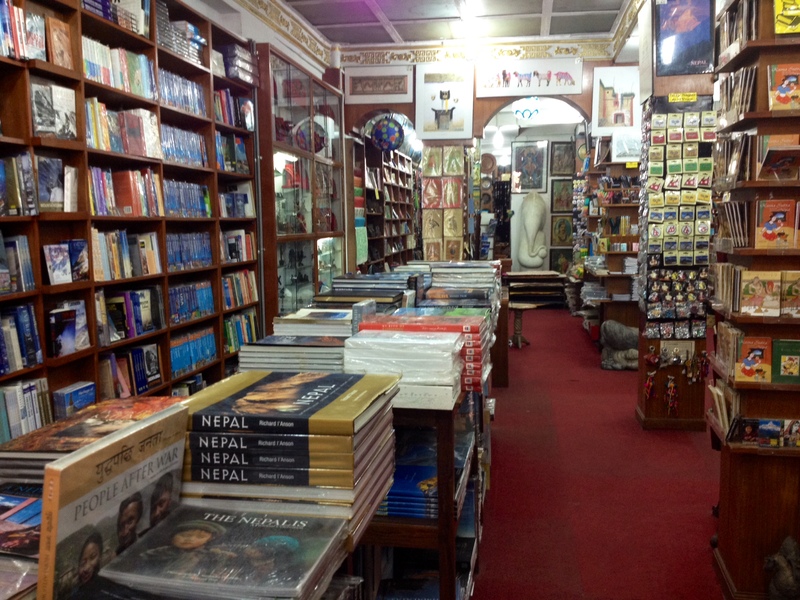 Before we arrived in Kathmandu, where we would spend the beginning and end of our holiday, I dutifully researched bookshops. 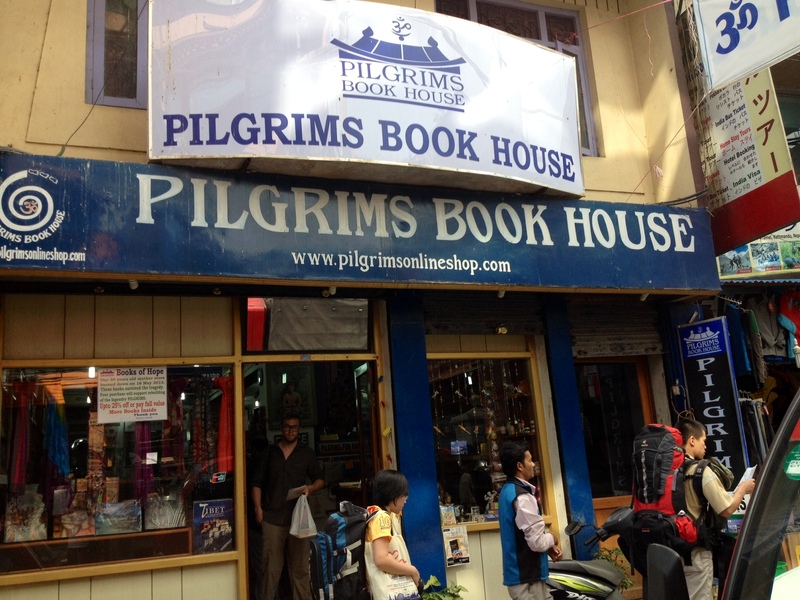 It seemed like if you were going to visit one bookshop in Kathmandu, it should be Pilgrims Book House. It turns out that this famous bookshop burnt down in May 2013. For more details, read this article which really shows what I have missed out on. It sounds like the old Pilgrims Book House was a very special place. Luckily, there is a second Pilgrims Book House, which is also pretty great – so I still managed to get my bookshop fix. 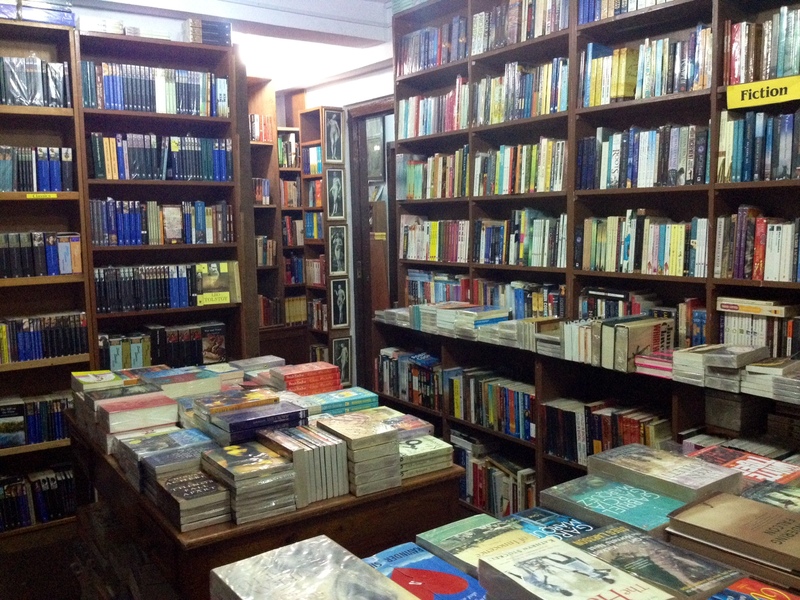 Pilgrims Book House is in the bustling district of Thamel in Kathamdu. This is a touristy area where backpackers roam the street, motorbikes and taxis speed around, narrowly avoiding pedestrians, and rickshaw drivers call out to tourists, trying to sell a ride. As is usually the case with bookshops, walking into this one has an immediate calming effect. I was pleased to see that Pilgrims Book House was not only large, but it was stuffed with books. Perhaps it isn’t quite the Aladdin’s cave that the other shop was, but it is still impressive. The downstairs room is huge, and at first appears to be filled with books. Unfortunately a lot of space is dedicated to souvenirs, which although make good presents, are the same quality as the knick knacks found in the nearby shops, but at a greater price. Still, I can’t complain! 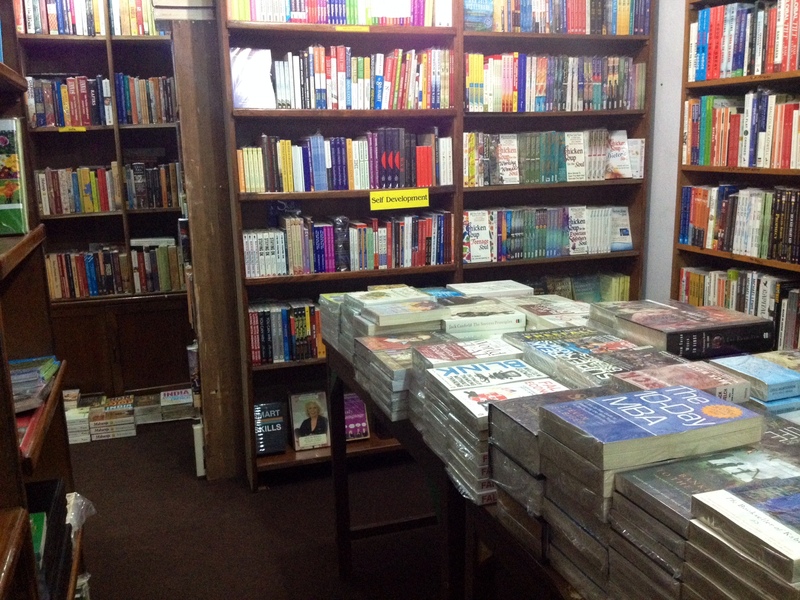 The whole of the left hand side of the shop was packed with books. On the shelves as you first walk in, there were the obvious choices such as Into Thin Air by Jon Krakauer and other mountaineering books. There was also a good variety of travel guides. Piled high on the centre tables, I found some really fascinating books. Unfortunately these were much too large and heavy to go in my already overfull backpack. My favourites were the photography books, particularly Portrait of Nepal by Kevin Bubriski and the simply named Nepal by travel photographer Richard I’Anson. I would have loved to take one of these books home, but they will have to go on my wishlist instead! I’ve already mentioned the souvenirs, and there really are a lot of them! You can get felt hats, slippers and purses, postcards, calendars, stationery, incense sticks, boxes, playing cards and many, many other treats. If you only have time to visit one shop, then this could certainly answer all of your gift needs, but I would recommend browsing all of the fantastic shops nearby too. You’ll probably get a much better price and more choice, as well as getting a chance to see a bit more of Kathmandu! 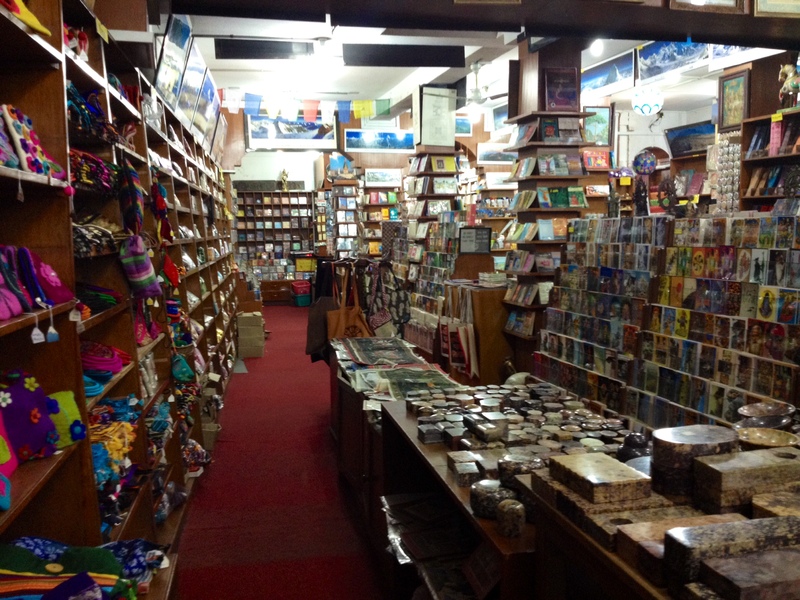 Once you’ve fought your way through the souvenirs, there are more books at the back of the shop and a collection of maps which could come in handy when planning a trek! 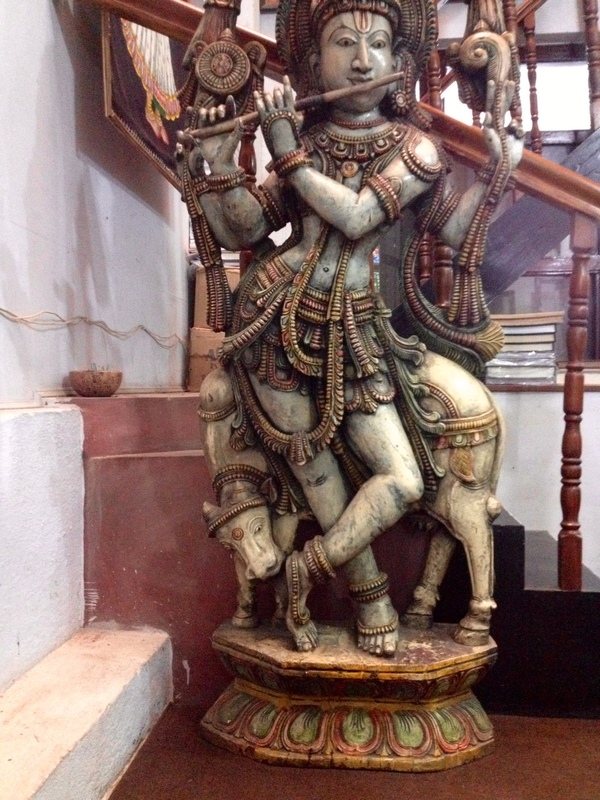 Walking up the stairs, I enjoyed the art work on the walls and was slightly surprised by the large statue greeting me at the top. 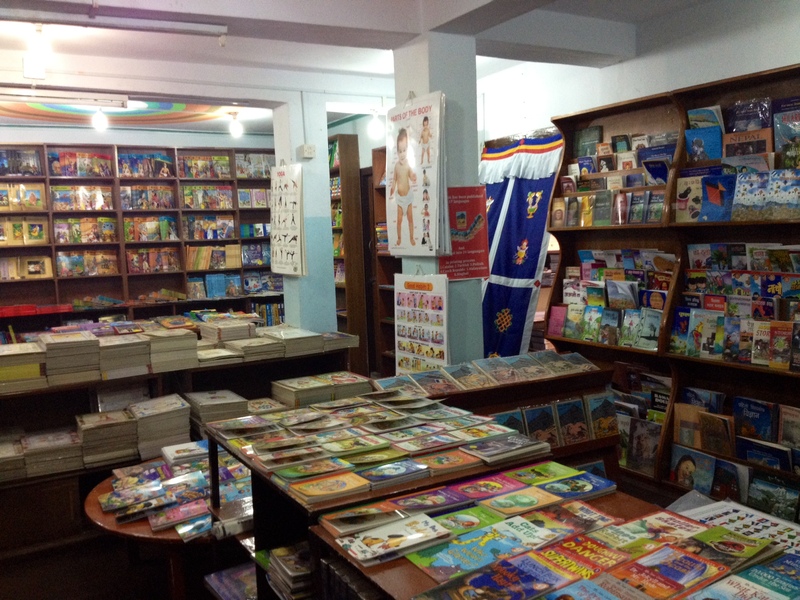 I was also happy to see a brilliant and very generous children’s section. They had everything from picture books to Harry Potter and much more. Leading off this fantastic corridor, I found a number of smaller rooms which were also packed with books. These little nooks are a brilliant place for a bookworm to hide from reality for a bit. I lingered the longest in the fiction room, where I chose a book for the long journey home; Sold by Patricia McCormick. Other rooms concentrated on other subjects such as Self Development, Tibetan and Indian Literature and Buddhism. I’m so glad that I managed to squeeze in some time to see Pilgrims and I strongly recommend making your way there too if you are ever in Kathmandu. The address is: Pilgrims Book House, JP Road, Thamel, Kathmandu, Nepal (Tel: +977 1 4700942, 4700919, 4221546 or 9803926019). 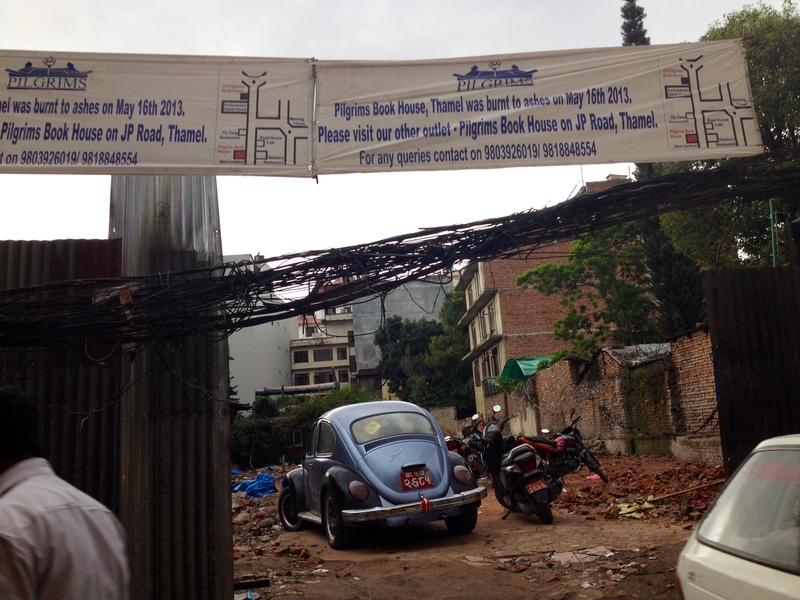 For directions (the streets of Kathmandu can be a bit confusing!) and to learn more about Pilgrims, visit their website. What a wonderful place but how tragic that the original place burnt down. 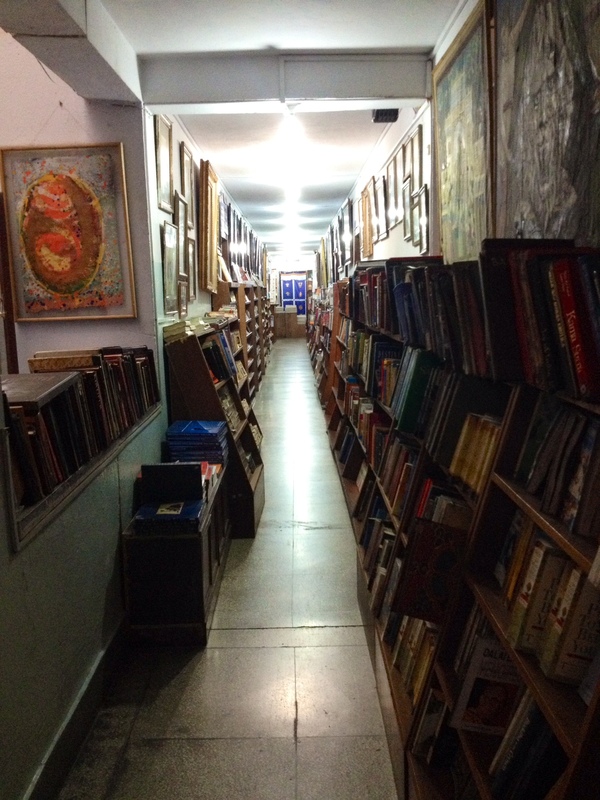 We came across so many wonderful and quirky bookshops when we were in India….I wish I’d been mindful enough to take more photos while I was there but we were so bewildered (in a good way) by the entire trip that I would never have thought! There wasn’t a quite moment while we were there! Kathmandu looks brilliant. Need to visit immediately…. I was really surprised with how many bookshops there were! I have lots and lots of photos of bookshops, but a lot of them were the same, touristy type of bookshop. This one really stood out. It would be nice to have a closer look at some of the other ones though. I always try to take photos of bookshops wherever I am, even if I don’t end up writing about them. It’s so much easier now that I have a half decent camera phone too! Welcome back! Understand you’re coming to see us early December with your Mum. Tell us all then. PS Title for my next novel “The Burning Bookshop of Kathmandu”. Thanks 🙂 I had a wonderful time! I’ll look forward to telling you all about it in December.